VANPORT, Pa. (AP) — A battle is brewing among several entities over financial responsibility for water treatment, and the township municipal authority — for the time being — is stuck in the middle footing the bill. That bill — estimated by the Pennsylvania Department of Environmental Protection to be $5,500 a month — pays for two “air stripper” towers that treat Vanport Township’s water before it goes to more than 10,000 customers in Vanport, Brighton Township and Ohioville. 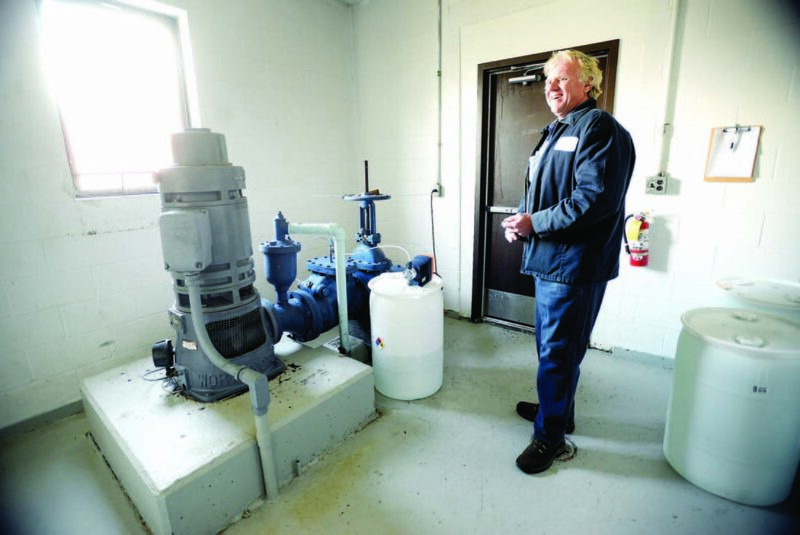 Gary Grimm, superintendent of the water plant, stressed that the water pulled from six wells on the municipal authority property is clean, even before it goes into the air strippers. Those air strippers, which clean contaminated water by blowing air through the water, causing harmful chemicals to evaporate, are just another layer of protection to ensure clean drinking water is distributed to the area, he said. But even Grimm will admit he’s concerned that could change, all because of an industrial history that has left nearby ground contaminated with trichloroethylene, an industrial solvent that has been linked to birth defects and a laundry list of other health problems. The DEP late last year found extremely elevated levels of trichloroethylene, known as TCE, in several “test wells” located in the area behind the Brighton Hot Dog Shoppe and McDonald’s. The water pulled from the six wells on the municipal authority’s property near the Ohio River is clean. However, the test wells located less than a mile away are still part of the same watershed used by Vanport’s system, a fact that has prompted the DEP to enact a response that will cost a significant amount of money. Grimm said Thursday he cares deeply about the local water system and will never put out a product that could cause harm to customers. But that doesn’t mean he isn’t at least concerned, especially because TCE was found in the wells back in 1988. TCE was first discovered in the Vanport wells in 1988. At that time, no company would admit responsibility for the contaminated ground. The site near the Beaver Area Middle School has a long industrial history — first as the Curtiss-Wright Corp. plant that made airplane propellers during World War II, followed by a Westinghouse plant afterward. In April 1988, what was then the Department of Environmental Resources issued a boil water advisory that stayed in place for 20 months after “unacceptable levels” of TCE were found in test wells, according to an article written in The Times. The 16 test wells are located about a mile away from the actual drinking wells, so problems in the test wells don’t correlate to an immediate problem in the drinking wells. The test wells are located in close proximity to the site of the former industrial operations, while Vanport’s actual drinking water wells are located next to the Ohio River, behind Tamaqui Village. Repeated tests had turned up TCE levels that regularly exceeded 100 parts per billion and were even as high as 275 parts per billion. As comparison, federal levels currently set safe drinking water standards at 5 parts per billion. At the time, children under the age of 13 and pregnant women were advised not to drink the water. In addition, officials warned that TCE could be absorbed through steam, so hot showers also were advised against. The incident resulted in several lawsuits in the area, including one from a Brighton Township family whose daughter was born with heart defects that led to her death when she was 7 months old. The lawsuit was eventually dismissed after a judge ruled the infant’s death couldn’t definitively be linked to the presence of TCE. At the time, a Westinghouse representative admitted that solvents such as TCE were used in operations at the former plant, but the company refused to admit blame. Despite that, in June 1989, Westinghouse and DEP agreed to a “consent order” obligating Westinghouse to install and pay for the operation and maintenance of the two air strippers located behind Vanport’s municipal authority. According to a previous Times article, the cost to install the air strippers was about $2 million. It was 20 months before the air strippers, which process more than 1 million gallons of water a day, cleaned the water enough for the boil water advisory to be lifted. In 1995, Westinghouse merged with CBS, the communications giant with television and radio stations across the country. As part of the sale agreement, CBS also assumed responsibility under the consent agreement to continue paying for the operation and maintenance of the air strippers. According to the consent agreement, CBS had to continue paying for the air strippers until the 5 parts per billion level had not been exceeded for 15 consecutive days of sampling, 15 times in a row. DEP spokeswoman Lauren Fraley recently said that, consistent with the consent order, CBS in July 2016 ceased payment for the operation and maintenance of the air strippers after showing four years of water samples that met DEP standards. According to Fraley, testing between October 2012 and July 2016 showed TCE levels that were below the 5 parts per billion threshold. CBS declined to comment on the record for this story. “Although CBS believes that operation of the air strippers is not currently necessary given the influent sampling data it has collected, VTMA has chosen to continue the strippers’ operation to safeguard against any return of the drinking water to unsafe levels of TCE,” Fraley said. That means the Vanport Township Municipal Authority is paying more than $5,500 a month unexpectedly, just to safeguard against the return of TCE. Grimm, the plant superintendent, said he didn’t know the exact amount of the municipal authority’s annual budget, but he admitted water rates for customers could increase as a result of having to pay for the air strippers. The DEP has maintained a rigorous testing protocol for Vanport’s water since the 1988 incident and, until recently, the problem seemed under control. That is, until a recent sampling of the 16 test wells found TCE levels between 11 parts per billion and 45,000 parts per billion. “The department is concerned with the high levels of TCE in these upgradient groundwater wells and the potential for unsafe levels of TCE to migrate to the VTMA wells,” Fraley said. Because of those high levels, the DEP is going to enact a response near the test wells that includes continued groundwater sampling and an “assessment of the efficiency, future viability and alternatives to the air stripper system,” among others. “DEP’s goals are to better define the TCE plume and determine whether the current treatment can be improved in an effort to better address any future contamination issue,” Fraley said. In addition, the DEP will hold a public hearing to discuss its response. That hearing will take place at 6 p.m. Feb. 28 at the Vanport Township Municipal Building. “The most important thing to know is that their water is safe to drink and they are in no imminent danger of TCE contamination at this time,” Neil Shader, another DEP spokesman, said. For his part, Grimm said his only concern is providing clean water to customers. His caution is not only on a professional level, but also on a personal level. Grimm lives in Brighton Township and drinks the water he supervises. That doesn’t mean he isn’t worried, especially because the situation is largely out of his hands. The problem there, according to Grimm, is that the DEP has largely left Vanport “out of the loop” when it comes to the ongoing issue with CBS. Grimm said he doesn’t let emotions govern how he does his job, being that “emotions don’t solve problems.” But he did admit he thinks CBS should continue paying for the air strippers and said that the authority has hired lawyers to look into the situation. The DEP said it intends to file a complaint in federal court “that names CBS as responsible for the department’s response costs” to the current TCE situation, Fraley said. Between the oversight of DEP and the squabbling with CBS, Vanport officials are left with the daily task of ensuring more than 10,000 customers in Beaver County have clean, safe water to drink daily. Ronald Nardick, the president of Vanport’s board of commissioners, didn’t return a call for comment. For Grimm, that’s the only thing that motivates him on a daily basis. “I’m just going to do what’s best for my people and our water supply,” he said.